Our Pajama Party will be held at the Lake Las Vegas Hilton Event Center March 1st, 2019 from 7pm-9pm. Tickets are required for this event and can be purchased HERE. 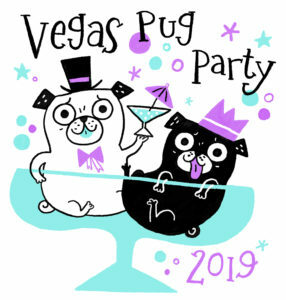 We will have special guest Claire Chambers of Chickenpants Studio doing custom portraits of puggies! To purchase your portrait, visit the Chickenpants event page! Portraits are $30, and 50% will be donated to Tiny Paws Pug Rescue! PLEASE BRING A PHOTO that you would like Claire to use to inspire the portrait! A big thank you to NULO Pet food who will be donating 120 gift bags for the Pajama Party with insulated doggy bags, kibble samples, treat samples, pouch samples, recipe cards and brochures/coupons worth about $20-25 retail! The products are great for even very sensitive pets!